Looking for the best lithium battery charger for your car? You’ve come to the right place. In this article, we’re breaking down all the information you need to know about the best lithium battery chargers. Lithium battery chargers are great for charging your car’s battery because they are compact, safe, powerful and portable. If you’re looking for a lithium battery charger you’ll find that there are plenty available so choosing a good one can be difficult. But this article will help you figure out everything you need to know. 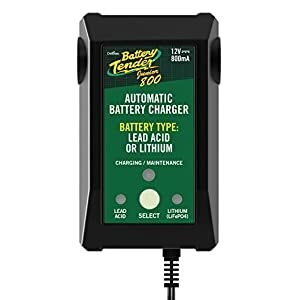 This a great charger for lithium batteries in cars, RVs, power sport vehicles, and law and garden vehicles. It also features spark-free technology to make it completely safe to use. The NOCO Genius G3500 charger features 7 different charger modes to help you more effectively start and charge any lithium battery depending on the voltage and drainage. It can completely recharge a fully-drained battery and safely maintain a battery’s charge. 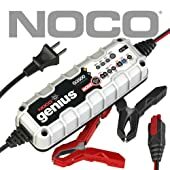 NOCO Genius G3500 can charge the 6V/12V batteries. Using this charger, you’ll be able to recharge your battery overnight. It has an onboard microprocessor that helps it charge more efficiently while minimizing energy consumption. It’s also very easy to use and intuitive, with LED lights to provide visual diagnostic and feedback information. Plus it’s very lightweight and portable so you can take it with you on the go without having to worry about it taking up a lot of space. The NOCO G3500 was built with performance and safety in mind, so it can charge 6V and 12V batteries up to 120Ah. And it has special overcharge protectors that allow you to leave this charger hooked up to your battery indefinitely without worrying about it overcharging. This 4 amp lithium battery charger works on 6v or 12V batteries and never overcharges. It can be used to charge and maintain a variety of vehicles ranging from ATVs to trucks and can even maintain RV and boat batteries. The Battery Tender lithium battery charge comes in a small, portable tin container and is great to use on 6V and 12V batteries. Moreover, it features an onboard microcontroller to help assure that the battery gets the correct amount of charge at all times. It also features Infinite Sequential Monitoring adaptive charging, which adjusts to the battery’s needs hundreds of times per second. It also has a lot of safety features to protect the battery from overcharging, reversed hook-up protection, and spark proof technology. This charger was designed to provide an excellent charge without worrying about safety concerns. Battery Tender 022-0209-DL-WH charger is the good ideal for lithium battery. In addition, the LED indicators easily show the state of charge and it comes with all the necessary rings and clips included. 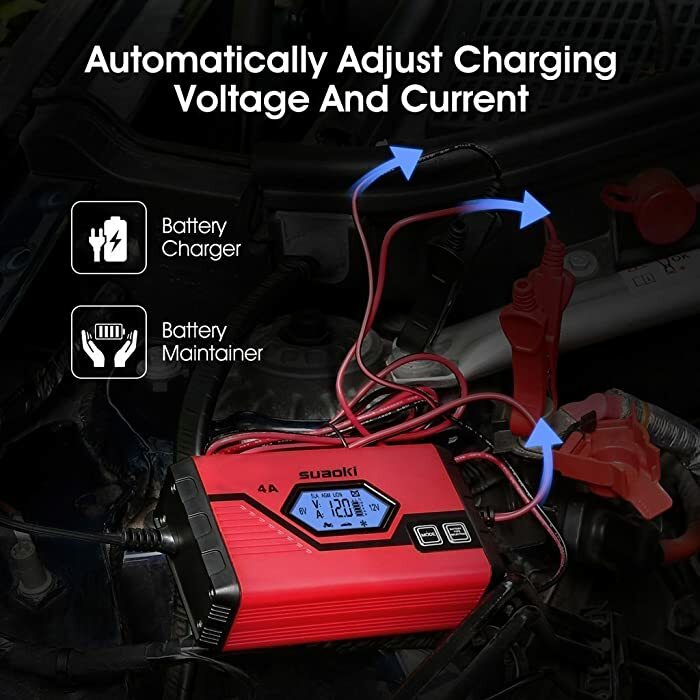 This is a great lithium battery charger for someone who wants to maintain their vehicle battery’s charge or who needs to fully recharge their battery from time to time. It’s perfect for people who don’t want to worry about things getting overcharged and who just want to set it and forget. 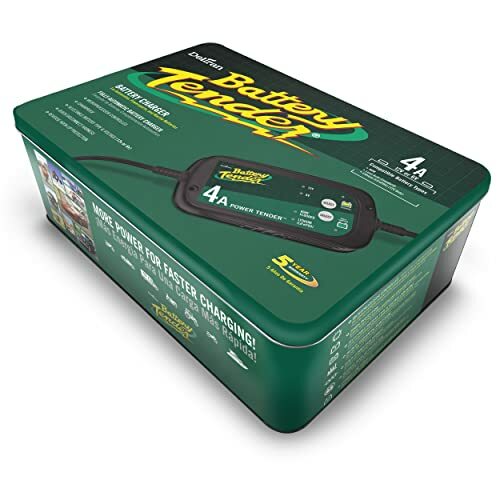 This is one of the top-rated battery chargers available because of the unique 8-step charging system designed to ensure maximum battery life and performance. It quickly and safely charges 12V batteries and can be connected to batteries for months without a problem. 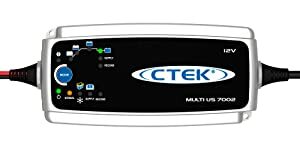 The CTEK 12-volt lithium battery charger features powerful performance enhancers and safety traits to ensure that you’re battery gets fully charged and even improves your battery’s performance. The 8-step charging system helps to recharge and recondition batteries that have not been used for a long time. In addition to that, it’s also great for maintaining battery charge and can help to increase a battery’s life. So using this charger will not only recharge your battery, but it will help you keep your battery working for longer than normal. It has multiple charging modes for normal conditions or cold weather conditions, plus a supply mode and maintenance mode. This is a powerful battery charger that is built to maximize performance while also protecting the user. The anti-spark technology and reverse polarity protection prevent you from any injury when hooking up the charger. In fact, it’s the perfect solution for keeping your car batteries charged if you don’t drive them often or if you have a vehicle with battery issues that needs to be recharged but you don’t want to buy a new battery. 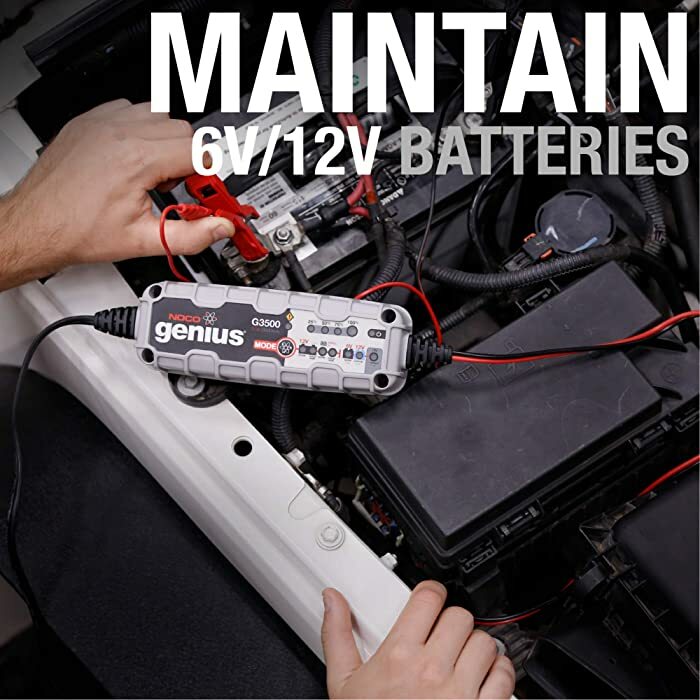 For someone who wants to bring a dead battery back to life or keep a working battery in excellent condition, this is a great choice. 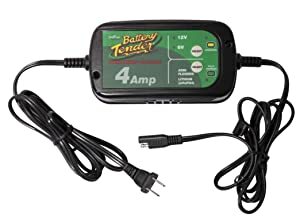 This is a really good lithium battery charger for someone who wants to recharge a battery that has issues holding a charge or maintain a motorcycle battery that doesn’t get used often. 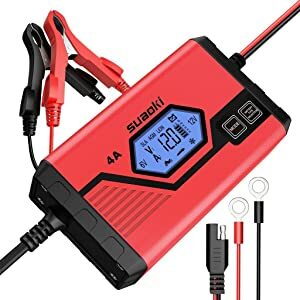 The SUAOKI 4 amp lithium battery charger is a smart battery charger that features special functions designed to automatically detect what amperage is needed, how much charge the battery has and how much charge it needs to supply. The 8-step charging method helps to fully charge your battery and then minimizes the current to maintain the charge. 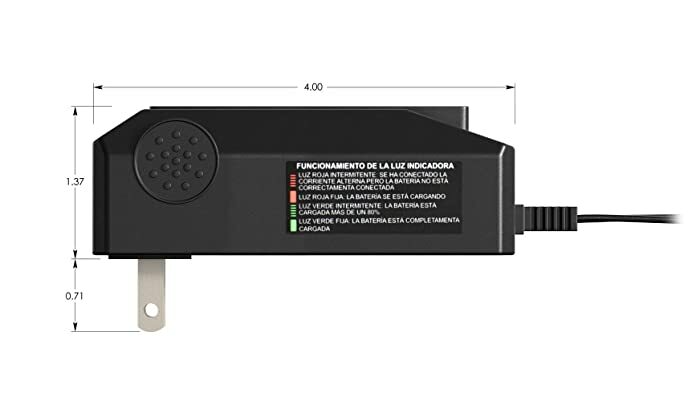 This charger features a backlit LCD screen to easily give you information about the battery’s charge, voltage, amperage, and more, which makes it very user-friendly. Furthermore, it also has over temperature protection to make sure the battery doesn’t get too hot, and a snow mode to be used when charging in colder conditions. The system automatically changes the current and voltage helps protect the battery. Another feature is that it’s waterproof, which allows you to charge your battery outside without worrying about the elements causing damage. And you can easily restore the last settings you use, which makes it convenient when recharging the same battery because you don’t have to waste as much time setting it up. The Battery Tender Jr. is perfect for keeping motorcycle and small batteries charged and running properly. It’s affordable, lightweight, and very easy to transport around with you. The Battery Tender Jr. is perfect for keeping motorcycle and small batteries charged and running properly. And it’s affordable, lightweight, and very easy to transport around with you. With the small size, Battery Tender Jr. is very easy to use. The Battery Tender Jr. is very compact and easy to use. It has simple LED lights to indicate when it’s charging and which battery mode it’s in. It’s perfect for keeping smaller batteries charged and maintained. In addition, it can also recharge some car batteries as well but isn’t quite as heavy duty as other Battery Tender models. It is designed with good quality materials and is very durable. Plus, because of its small size, you can easily charge any battery in any space without worrying about it taking up too much room. It’s a very affordable price compared to other battery chargers, making it a great option. There are many lithium battery chargers on the market. Some work better than others, depending on your situation and needs. The NOCO Genius 3500 is the most powerful and versatile smart lithium battery charger in our opinion. Because it can charge and maintain batteries for vehicles ranging from small ATVs to large RVs and boats. 1.Can I charge a lithium battery with a normal charger? Because lithium batteries and other batteries charge different, it is not advised to use a normal charger on a lithium battery. Make sure that you get a charger that works with lithium batteries. 2. Do lithium-ion batteries wear out? Yes, over time they do wear out. The typical lithium-ion battery life is 3-5 years or 300-500 charge cycles. 3.Can you recharge a lithium battery?